Medallion Pipeline Company began a binding open season to solicit long-term, firm shipper commitments for a major expansion of its crude oil pipeline system in the Midland Basin. The company plans to expand six pipeline segments to transport increased quantities of crude oil, produced from acreage proximate to Medallion’s system, to downstream pipelines and markets. The open season ends at 4 p.m. CDT, Aug.15. Medallion plans to construct a 16-inch operational loop of its existing Midkiff Lateral and expand the capacity of the Crane Extension, Reagan Gathering Extension, Santa Rita Lateral, Martin Lateral and Midland Lateral (expansion segments). Prospective shippers are provided with two commitment tiers subject to a minimum five-year commitment. Additionally, existing firm shippers will be provided the option to amend existing transportation services agreements. 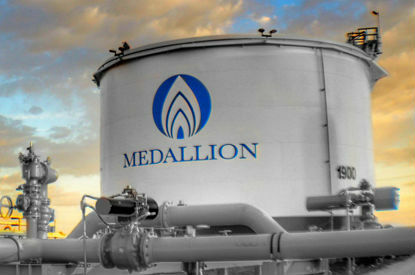 Initially placed in service in October 2014, Medallion’s crude oil pipeline has undergone a series of expansions to meet the increasing needs of producers and marketers in the Midland Basin. The existing system is a network of 700 miles of 6-inch and larger crude oil pipeline facilities that aggregate and transport crude oil production to the Colorado City Hub, the Crane Hub and the Midland Hub, providing access to multiple long-haul, large-volume pipelines for transportation to downstream markets.